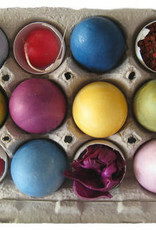 Easter egg dyes made from herbs and plant colors. Box makes egg drying tray! 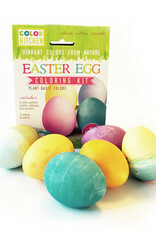 INSTRUCTIONS: What you need: Boiled eggs (1-2 dozen), white vinegar, spoons, and cups. Empty each color packet into a separate cup. Add 1/4 tsp water and blend thoroughly with brush to dissolve the powder. Leave for a couple of minutes then blend again. Keep mixing until all the powder has dissolved. Add 1 Tbsp white vinegar to radish and cabbage only (not annatto). Add 2 Tbsp water to all and mix. Put eggs in cups and turn over gently with a spoon to cover all sides. Dip quickly for pastel colors. Leave for several minutes for deeper shades. 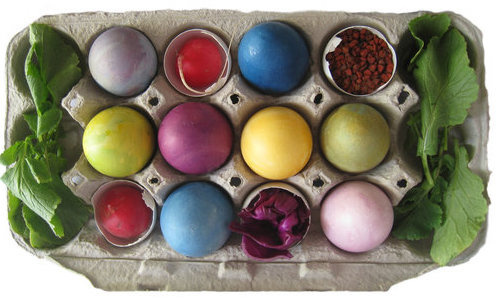 Take egg out with spoon and set in tray or empty egg carton. 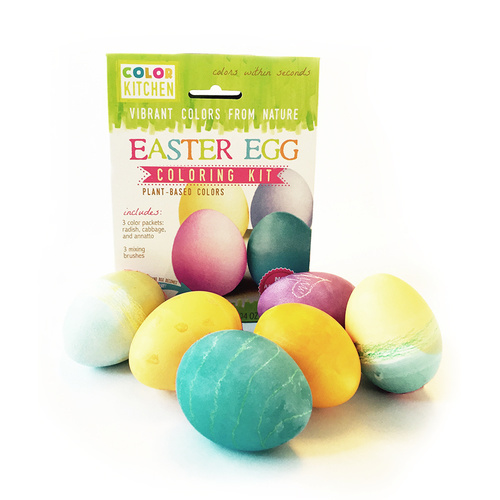 To combine colors, dab egg dry with a paper towel and dip in a second dye.